As gamers, we often let out a groan when we hear the term “educational game,” as we expect (and are rarely proved wrong) some generic, mundane experience ripping off one of the classics (Scrabble, Monopoly, or… Snakes and Ladders) with math problems or geography trivia pasted on top. But not every educational game is a total mess—especially when, like the game Set, the educational value is not so much in the form of a blunt force trauma of test questions but a more subtle, brain-bending experience. Set is made up of a specialized deck of cards. Each card has four elements on it, and each element can be one of three possible variations. The elements are number (1, 2, or 3 symbols), shape (diamond, oval, or squiggle), color (red, green, purple), and shading (filled-in, outlined, or striped). The deck contains one card for each possible combination of these four elements. Cards are dealt out in a 4×3 grid. 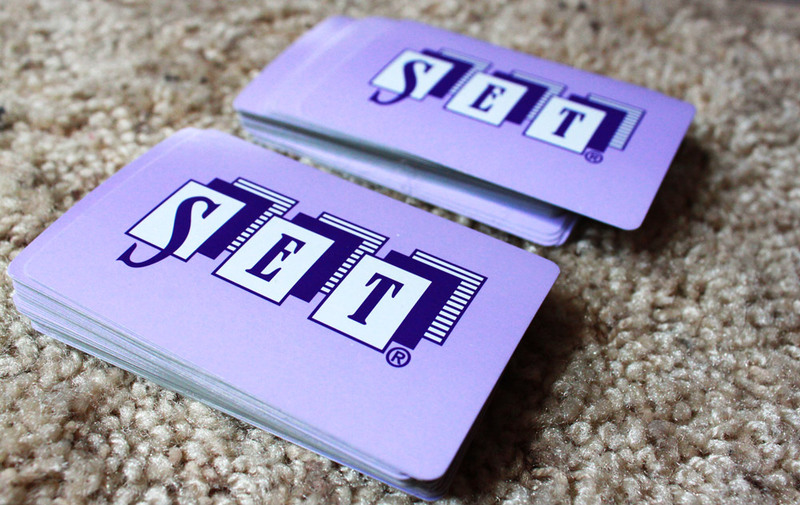 Players must find sets of three cards, call out “Set!” when they see one, and add it to their personal pile, replacing the empty spots on the grid. The game goes until the deck runs out of cards and there are no more legit sets to be found, and the winner is the player with the most sets collected during the game. Can you find the set(s)? The sets are where it gets tricky. 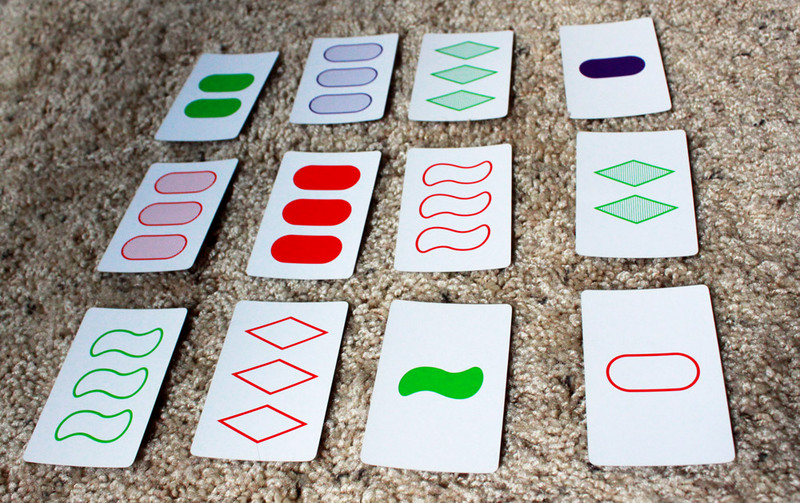 A set is a grouping of three cards in which each individual element is either the exact same as each other card in the Set, or the element is different on each card. So, you could find a set of three oval cards, numbered 1, 2, and 3, all filled-in, and all red. However, if two were red and one was purple, it’s not a set. There are a huge number of possible sets, since for any two cards chosen randomly from the deck, there is a card in the deck that could be combined to make a set. What makes this an “educational” game is the brain function required to be successful. It’s not a strategic game or a knowledge game, or even a memory game. It requires the use of both the logical side of your brain as well as the creative side by involving numbers as well as colors and shapes. It may not sound particularly intriguing or difficult, but it is quite surprisingly challenging and fun. If you haven’t played it before, you probably don’t believe me when I tell you how difficult it is to find a set. Your brain has to work hard to process the different elements of each card; you can stare at the 4×3 grid for quite a while before finally making the connection that is right in front of your face. The game was specifically designed to require both brain halves, and since most people tend to favor one side or the other, players will have to put their weak sides to work to make any progress. What makes Set work, though, is how easy it is to start and stop. I don’t necessarily mean ending the game early; I mean the fun comes in the playing of the game, and it’s easy for players to jump in or out. Once you give it a try and see how difficult it is, it becomes exciting to just find even one set before anyone else; the experience of playing (and teaching your brain new tricks) matters far more than scoring points or winning at the end. Unless, of course, you’re playing with a small group (2-4). Or against your wife. For the same reasons, it’s easy to pull out between games, or while waiting in line for something, or at a party. It can accommodate any number of players, as long as everyone involved can squeeze in around the table. Kids can play just as competitively as adults (although at certain ages, they might be too young to fully grasp the concept). The toughest sets are when every element is different. Set is definitely an abstract game; it doesn’t even pretend to have a theme; and that’s a good thing. It’s not trying to sell a story, or replicate a strategic experience. It has no arc; it does not build tension over time to reach a climax. But it is simple, easy to set up and teach, and very challenging. It’s fun to play even if you lose, because once you realize the difficulty it’s very enjoyable to try to master it, and all the while you’re teaching your brain and practicing using both creativity and logic at once, without even realizing it. It’s great for big groups wanting to do something more casual, or for situations when it might be impossible to hold a group’s attention span for too long. But if you bring it out at your next party or family gathering, you’re certain to attract attention, and you’ll find people excitedly searching to find the next set first. Much like Tetris, the simplistic but challenging puzzle will keep you hooked for just one more set. It’s a low-cost game, small and easy to carry, with a nice hard plastic case. This little guy is definitely worth adding to your library. I’m not a big fan of Set. Much like the games the teachers used to roll out during indoor recess when I was in school, Set feels like an educational game. It feels like an attempt to get me to eat my vegetables. It exudes the “parents and teachers, take heed: this game is good for your children” vibe. It’s hard to make a successful “game” when that layer is so prominent. Not a Set – but can you figure out why? Set is a game that works very well with people who are all on similar skill levels (skill level generally improved through experience). It’s harder to recommend for groups of different skill levels. Because Set does force players to use their brains differently, those who are most used to doing so generally perform better. This can be frustrating for newcomers who must stare at the board and before they can even get a handle on what’s out there, other players are yelling, “Set!” which completely derails any abstract thinking that was taking place. Okay it’s a little bit ugly. But @Futurewolfie gets Set’s appeal absolutely right: it’s a game that anyone can jump in and play, and it plays, sets up, and tears down quickly. I don’t know what kind of “line” Set is good to be played in (maybe if you’re camping out at Best Buy the night before Black Friday? ); to me it seems like the set up is a little much for most queue situations. But Set is something that can easily be taken to a party and put away when something less lame is happening (which, hopefully, will be soon—if playing a puzzle game at a party is the least lame thing happening, you might want to just find a new party). And even while I find Set to be too educational (and thus my brain revolts against it), others do not. On one occasion where the game was pulled out, a nine- or ten-year-old boy sat at the game transfixed, trying to find the next set. But I guess even I liked indoor recess. Set feels more like a puzzle than a game. If you like Sudoku or crossword puzzles, well, I recommend sticking to those. But if you absolutely must do a puzzle with someone else, you can do worse than Set. But you can also do much better. Next Article FDQ: What Gaming Moment Was Epic? 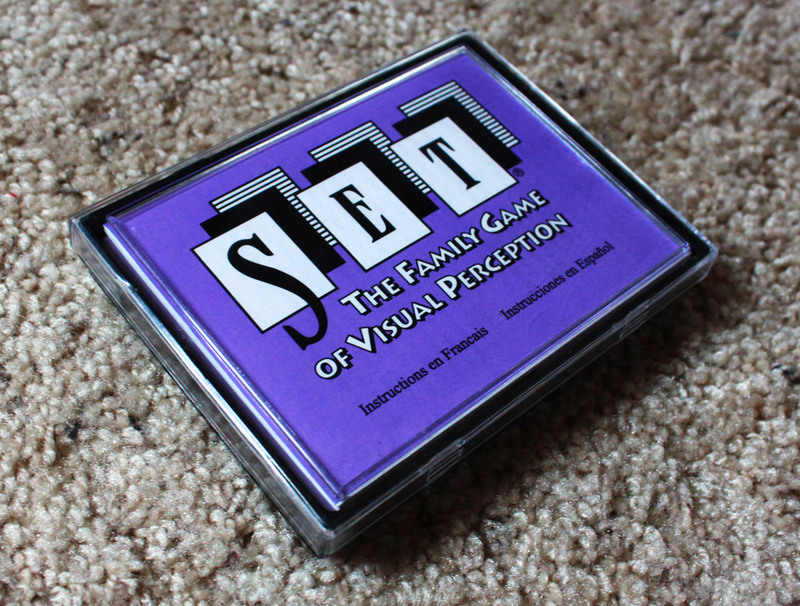 I don’t see Set as educational at all, though it is certainly “brainy.” It’s usually not my first choice for a game to pass the time, but if someone else suggests it, I’ll happily go along.